Silverado Records has announced the Silverado Signature Songwriters Series, first volume to feature Nashville songwriter Zack Dyer. Silverado Records, an independent Country music record label, today has announced a new audio series project to be titled the Silverado Signature Songwriter’s Series, featuring recorded tracks from Country music songwriters. The series pays homage to the immense and diverse songwriting culture prevalent in Nashville and Country music as a whole. The first featured songwriter on the series is Nashville based Zack Dyer. The release date for the first volume in the series will be announced soon, and the label intends to release several volumes per year. “This is a great way to connect music fans with the best songwriters, as well as Country music’s future stars” said Silverado Records CEO Scott Thomas. “Zack is the perfect talent to kick this off, and represents well the abundant talent out there in the songwriting community. We’re very excited to get this out there,” he added. About Silverado Records: Silverado Records is an independent Country music record label. Founded in late 2015 to bring great Country music to the world, and to be a platform where independent artists can launch. 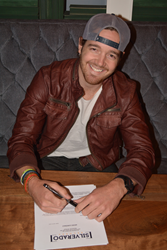 Headquartered in Nashville, TN the label’s artist roster includes Gage West and songwriter Zack Dyer. Silverado Records music is distributed digitally by The Orchard.